Are you gearing up for your next trip of a lifetime? Of course, if you are, the rooftop tinny has to make an appearance! After all, how else can you get a boat to those rugged spots that are truly special? Rooftop tinnies are synonymous with adventure, whether it’s fishing, sightseeing or just relaxing on the water. But managing a rooftop tinny isn’t always easy. If you are travelling solo, or even with a companion, getting your tinny off and onto your roof is hard work. The solution: a rooftop boat loader! So what exactly are the benefits of a rooftop boat loader? Read on to find out! Have you ever lifted something heavy and felt the dreaded twinge in your back? If so, you are one of many! When you’re talking about the benefits of rooftop boat loaders, you simply cannot overlook safety. In reality, loading and unloading a boat without any help is downright dangerous. The damage you can do to your back is just not worth it. Even with some friends to help you out, the risk remains. So why not eliminate it? A rooftop boat loader does the heavy lifting for you. So your boat is loaded and you’re roaring down the highway. Destination: the campsite of your dreams. Travelling at high speeds with a load on your roof will put some serious strain on your tie downs. You really want to be sure your tinny is secure up there, or the consequences could be catastrophic. 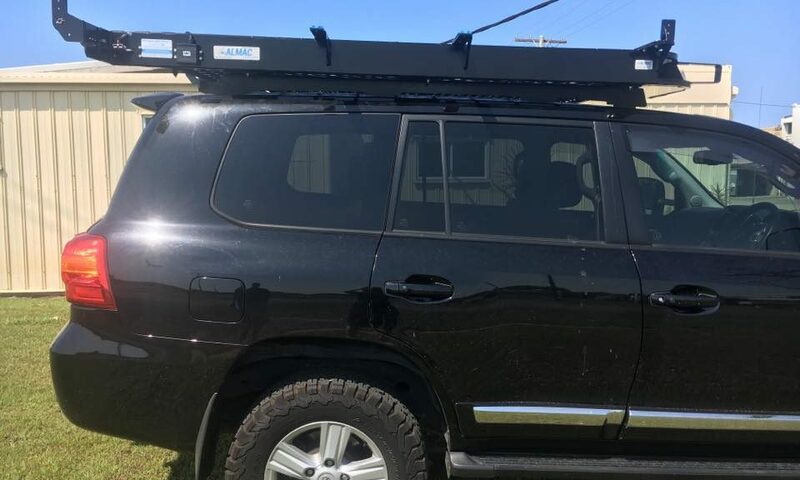 Rooftop boat loaders help you position your car-topper in a way that allows you to secure it effectively. So stop the second-guessing and enjoy peace of mind, with a rooftop boat loader! You’ve done it – you’re at the campsite and ready to go! But the tides are changing and you need to get your boat in the water ASAP! With a rooftop boat loader, that will not be a problem. Instead of mustering the troops for a time-consuming struggle, simply allow the boat loader to take the strain. Your boat will be on the bank and ready to go in no time! Your rooftop boat loader will get you in the water faster, every time. 4. Rugged launch? With a rooftop boat loader, that’s no worries! If you have a tinny loaded on the roof of your four-wheel-drive, then chances are you’re heading somewhere rough. After all, that is the advantage of a rooftop tinny! But rugged terrain takes all forms imaginable. From steep banks to thick scrub, your adventures will probably involve the lot. And some terrain is simply too rough to unload a rooftop boat manually. When the bush is prohibitively thick, or the bank excessively steep, you may face some serious issues loading and unloading. But with a rooftop boat loader, that won’t be such a challenge. You don’t have to worry so much about balance – simply let the boat loader do the heavy lifting. Rugged adventures often need a car to match. For a lot of 4wd owners, this means time and money spent on expensive accessories. Things like roof-mounted lightbars, ariels and wiring are often necessary to help you get into the really rough areas. But this can come at a cost; accessories like that are quite exposed, especially when mounted on the roof. A rooftop boat loader will help keep your tinny clear of your accessories and avoid any accidental breakages. Are you looking for a new boat loader? Get in touch with the experts at Almac Trailers today on (07) 4152 3737.